Remember Catch? Is anyone even going there these days? Is Catch over? (I am not based in LA, these are earnest questions.) I ask, of course, because celebs are at Craig's in quantity this week (and most weeks), and I don't think we've used a photo of anyone leaving Catch in MONTHS. Craig's seems to be a place that celebrities genuinely love to visit, because they certainly don't all need the publicity of being "spotted" at Craig's while waiting for the valet. In fact, some people try to creep out of Craig's back door and avoid the cameras all together. But then they just get photographed in front of a pile of dirty cardboard boxes, like Katharine McPhee. In any case, Craig's always makes for great bag-watching. Here's Amy Adams, outside of Craig's in LA with a lovely new, studded Ferragamo Sofia Bag. You don't need these pics to circulate when you have multiple Academy Award nominations. She probably just really loves the food! LA socialite Lisa Gastineau also dined at Craig's this week with a sizable Chanel Flap. Here's Hilary Duff, making her way around LA with a supple, red leather Fendi Backpack. She's also wearing a shirt from the Fendi Mania collection. Victoria Beckham rarely carries anything other than her own designs these days. She was recently spotted leaving her hotel in NYC with a python version of the Victoria Beckham Eva Clutch. Here's Katharine McPhee, obviously trying to sneak out the back door of Craig's in LA with a charming Les Petits Joueurs Crossbody Bag. Sophie Turner is seen here walking head first into a blast of camera flashes right outside of Craig's with a Louis Vuitton New Wave Chain Bag. 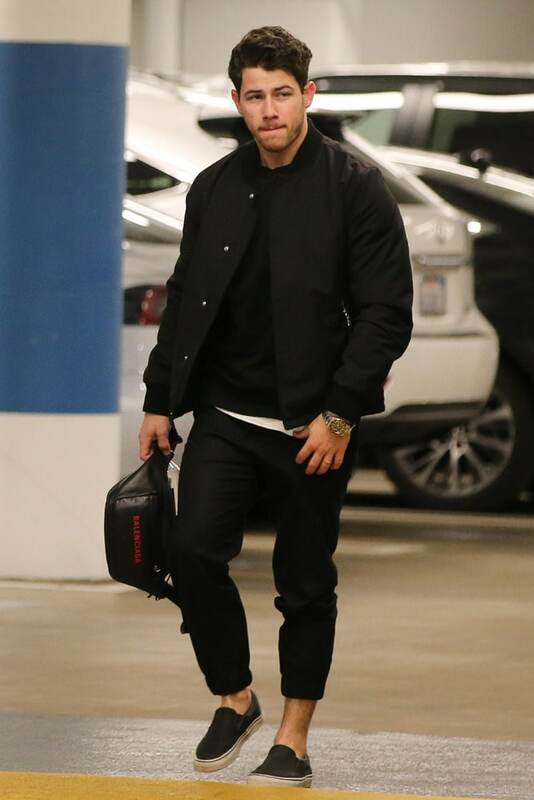 Nick Jonas brought this svelte Balenciaga Belt Bag to a meeting in LA, which I think we should point out did NOT take place at Craig's! Finally, here's Natasha Lyonne, posing on the sidewalk just outside of Build Series in NYC with a velvet Fendi Kan I Bag. She is making the press rounds to promote her new Netflix series, Russian Doll.